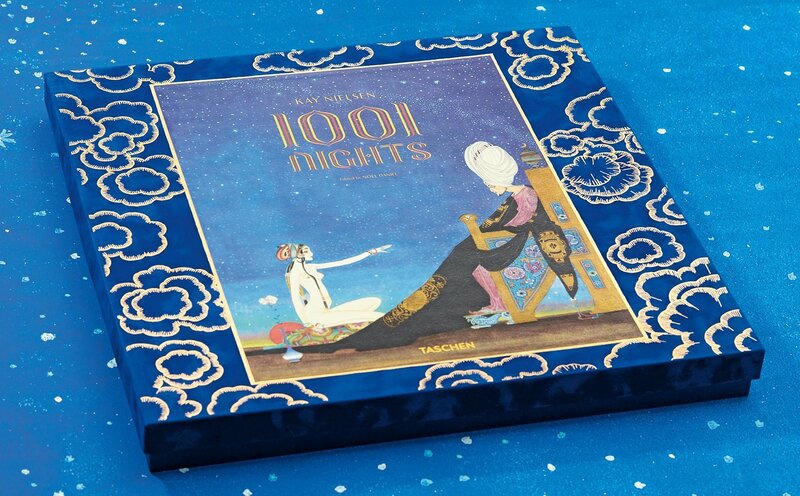 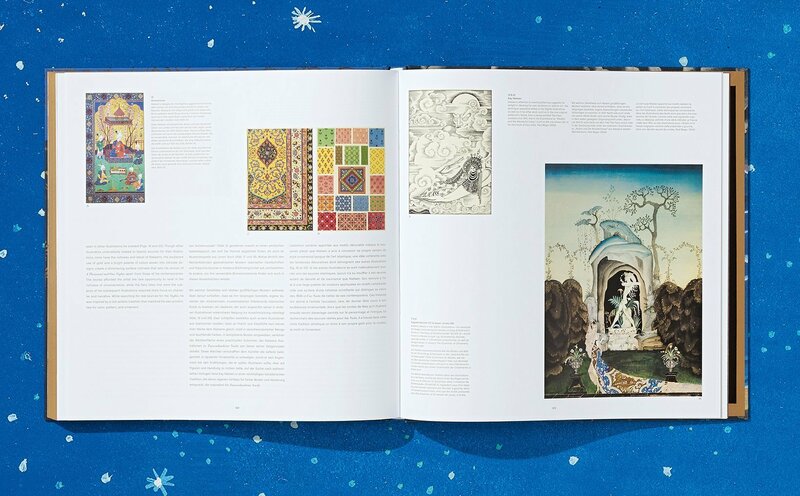 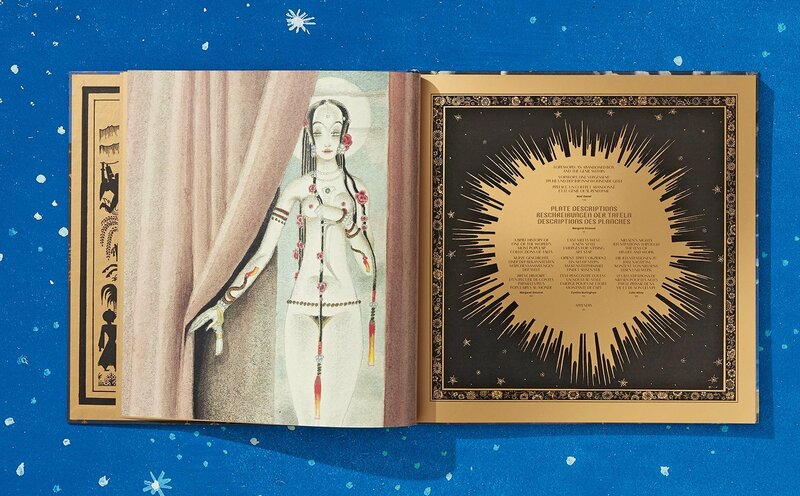 This XXL fine art portfolio revives Kay Nielsen’s illustrations for a world heritage classic, A Thousand and One Nights. 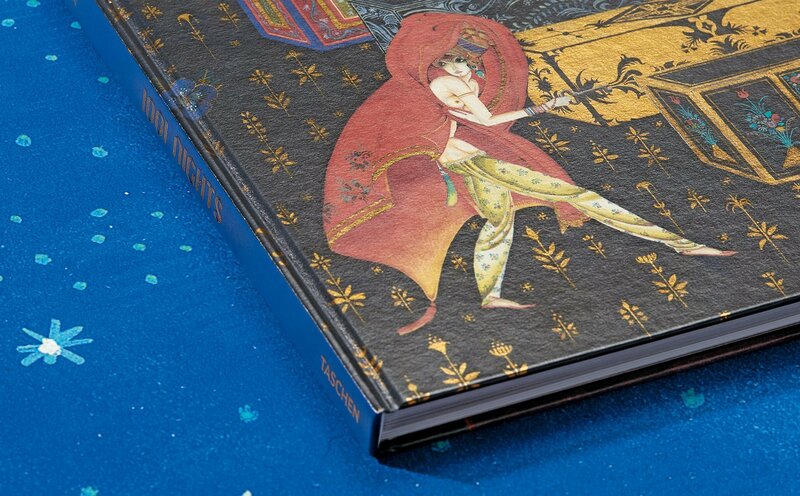 Printed for the first time ever in five colors including gold, the 21 prints are reproduced directly from Nielsen’s original watercolors, allowing his sumptuous hues and rich influences to dazzle. 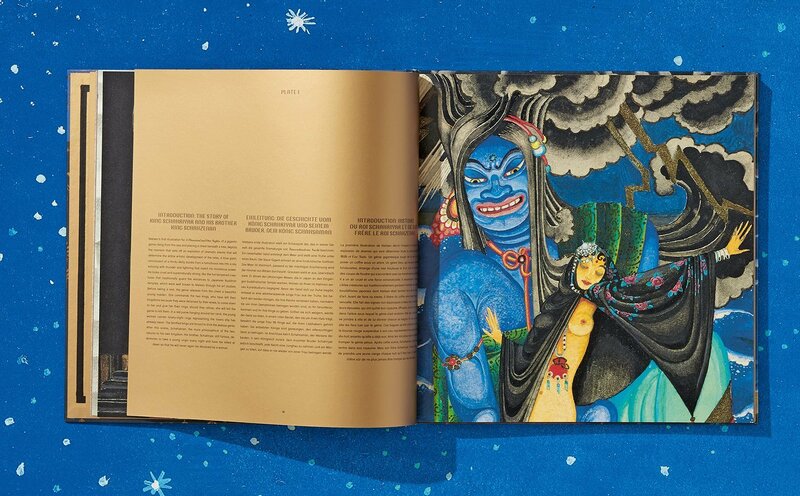 A companion book features image descriptions, essays, and other rarely seen artworks. In the late 1910s, in a Europe ravaged by World War I, Danish illustrator Kay Nielsen put the finishing touches on his illustrations of A Thousand and One Nights. 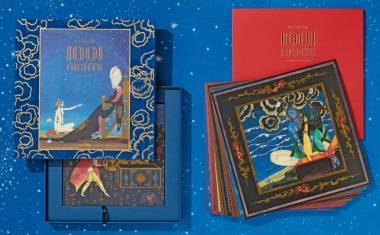 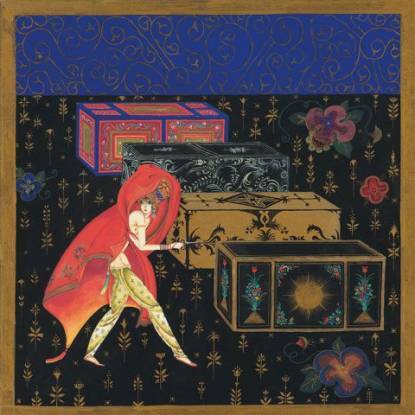 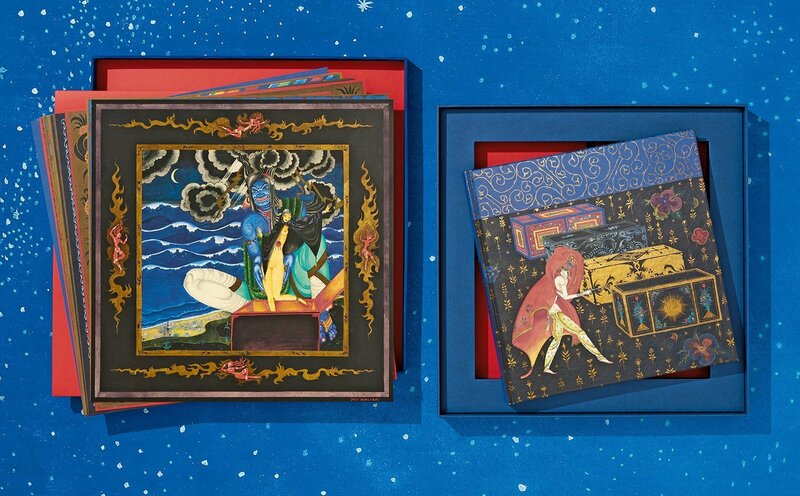 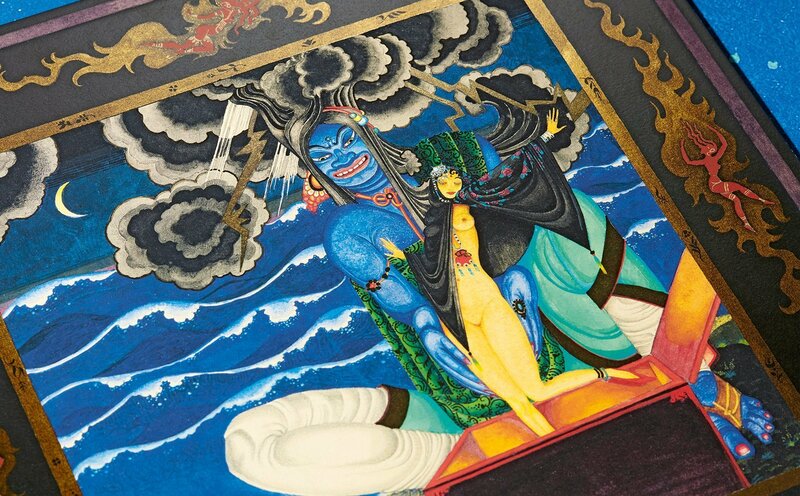 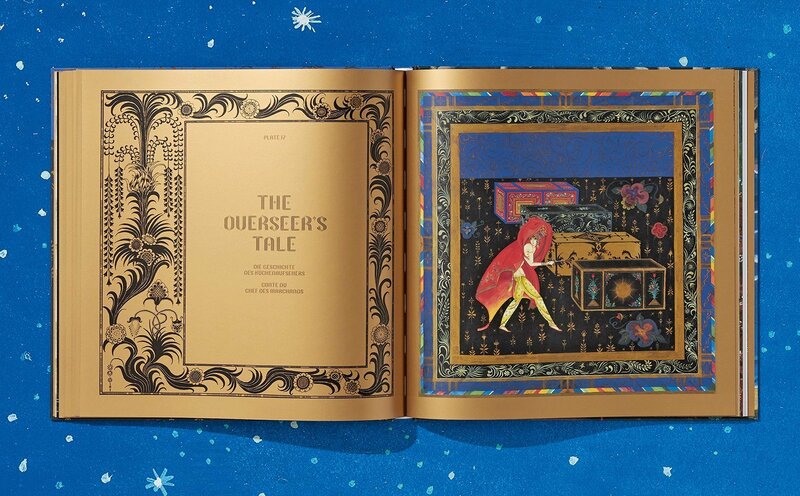 The results are considered masterpieces of early 20th-century illustration: bursting with sumptuous colors of deep blues, reds, and gold leaf, and evoking all the magic of this legendary collection of Indo-Persian and Arabic folktales, compiled between the 8th and 13th centuries. 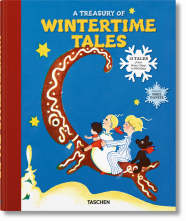 In the financially strapped postwar climate, however, publishers retreated from Nielsen’s project and the publication never happened. 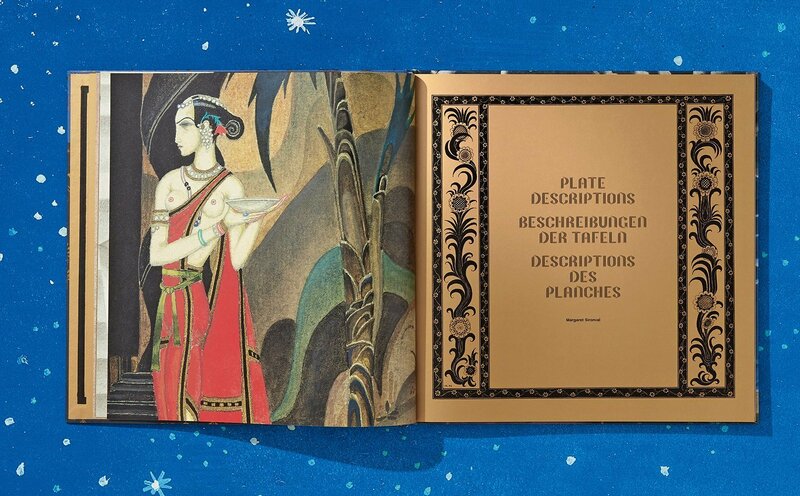 A rising star, Nielsen moved on to other work, and the spectacular pen, ink, and watercolor images of this world heritage classic remained under lock and key for 40 years. 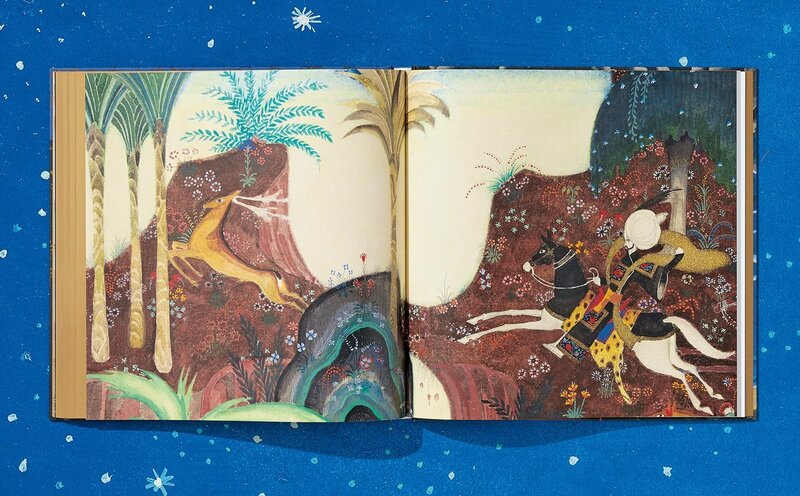 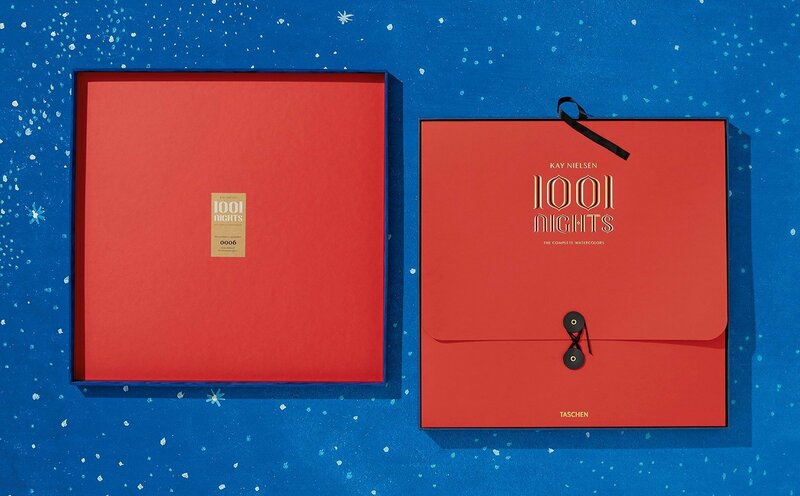 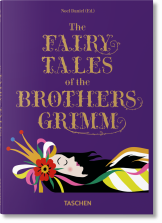 Published just once in the 1970s, the illustrations were rescued from oblivion after Nielsen’s death in 1957 and are now held by the UCLA Grunwald Center for the Graphic Arts at the Hammer Museum in Los Angeles, the Art Institute of Chicago, and in two private collections. 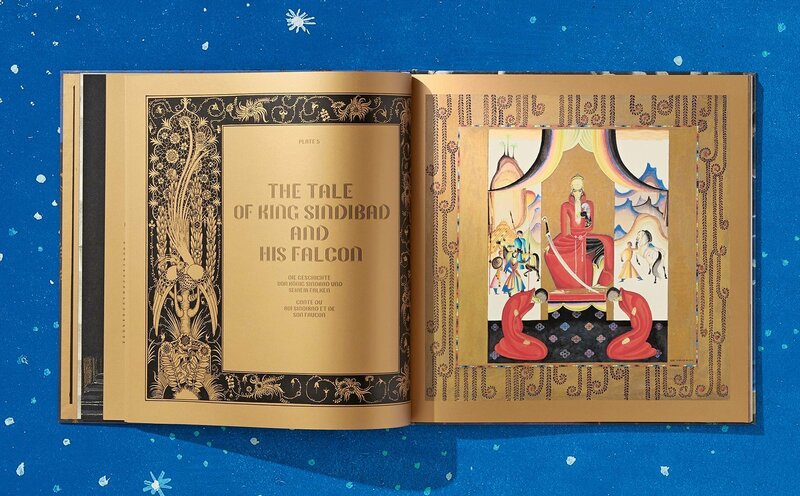 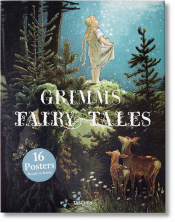 Published for the first time ever in five colors including gold, this unique presentation of fine art prints revives all 21 strikingly beautiful illustrations reproduced directly from Nielsen’s original watercolors—the only complete set of his beloved illustrations to have survived. 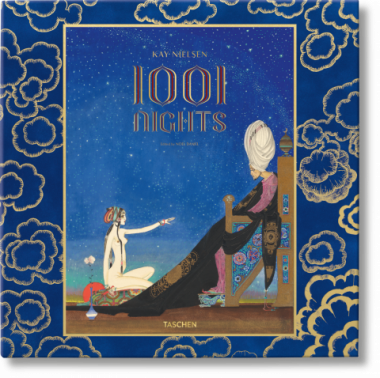 Each illustration is presented individually in an extra-large format and on fine art paper, allowing Nielsen’s graphic mastery and rich array of influences, from Art Nouveau to Japanese woodcuts to Indian painting, to dazzle. 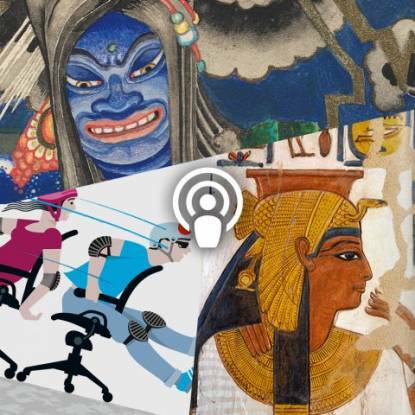 Cynthia Burlingham has been Deputy Director of Curatorial Affairs at the Hammer Museum in Los Angeles since 2011. 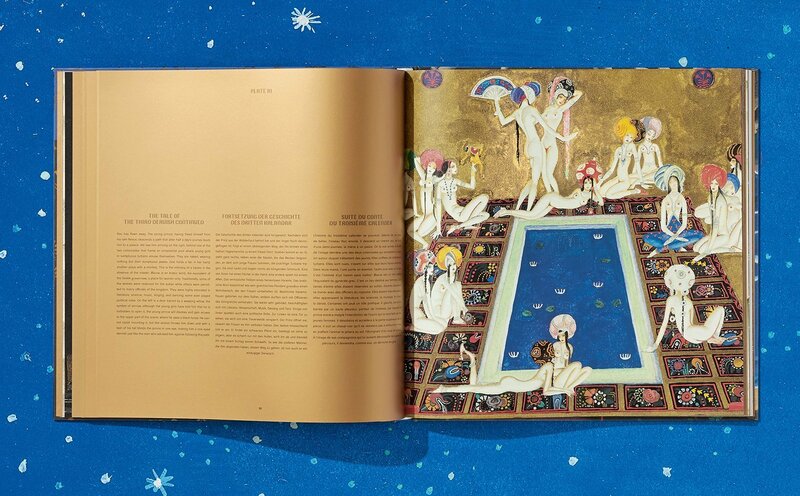 She is also the director of the UCLA Grunwald Center for the Graphic Arts, a position she assumed in 2005 after holding various curatorial positions at the Grunwald Center. 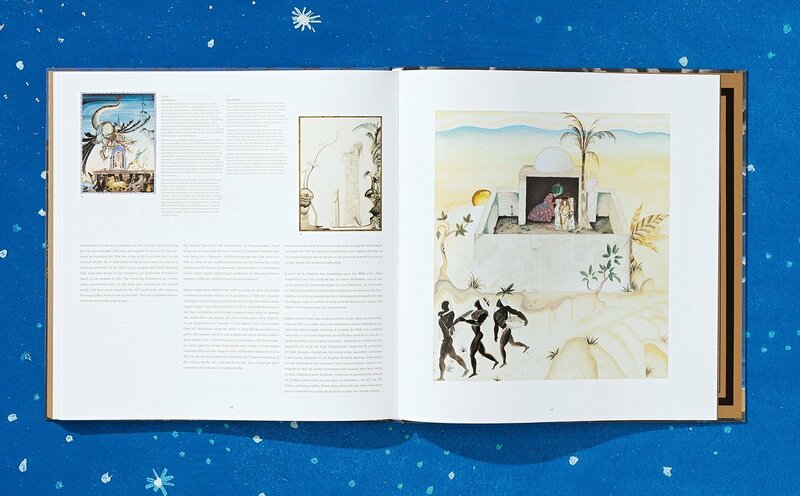 She has curated numerous exhibitions and has lectured and written extensively on the history of prints and drawings from the 16th through the 20th century. Margaret Sironval received a PhD in literature from the Sorbonne, and was a researcher at the National Center for Scientific Research (CNRS) in Paris from 1981 to 2005. She has published numerous articles and organized exhibitions on A Thousand and One Nights. She is the author of The Album of A Thousand and One Nights (2005) and A Thousand and One Nights (2011), in which she analyzes the transmission of the tales. 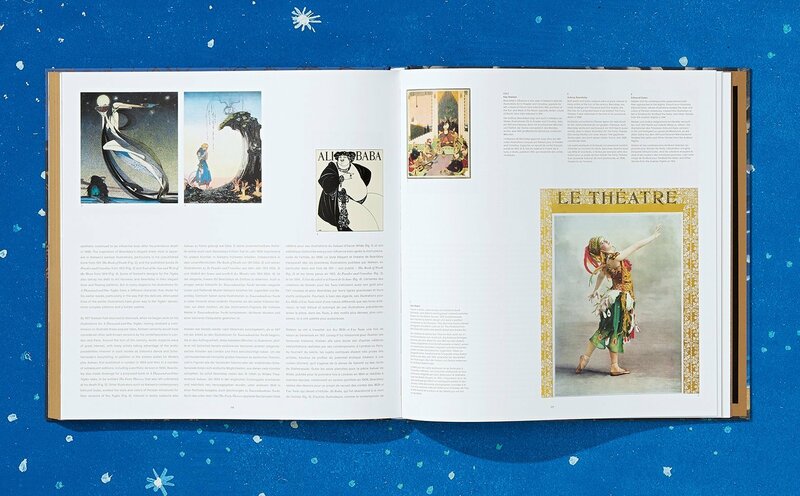 British art historian Colin White specializes in early-20th-century illustration, including the work of golden age legends Edmund Dulac, Jessie M. King, Thomas Mackenzie, and Kay Nielsen. 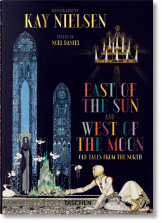 His published works include biographies of Dulac and King, a forthcoming biography of Nielsen, and an essay in TASCHEN’s East of the Sun and West of the Moon (2015). 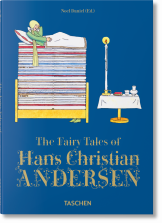 He has also written on sentimentality in art, Edward Ardizzone, and W. B. Yeats.